This is something that just about everyone has experienced—waking up early in the morning and needing to check the time, but not being able to focus on the clock. 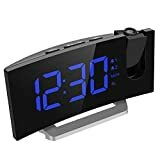 It’s only worse if you have an older manual alarm clock that doesn’t have lit numbers or if you use your cell phone as an alarm, because then you have to find it, push the right button to get the time to show up, and then try to focus your eyes on the numbers. 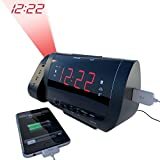 A projection alarm clock solves the problem. The numbers are projected onto the wall or ceiling, and are (usually) big enough that you don’t need to fully wake up to see them; all you need to do is roll over and open your eyes and there they are. 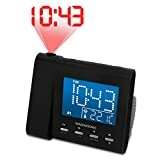 Here is how you can find the best projection clock for your bedroom. 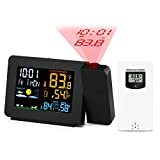 Clock radios: Most projection clocks come with radios, which gives you the option of waking up to a standard alarm or to hearing your favorite radio station. 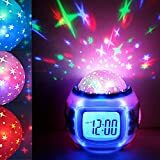 Children’s radios: There are also plenty of projection clocks that are designed especially for kids, with bases and projections that feature vibrant colors and fun shapes. 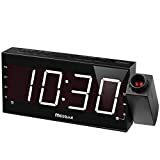 Setting options: “Traditional” clocks are set by users at the time of setup, but there are also many “self-setting” clocks on the market that automatically detect the correct date and time, and then set themselves. Number clarity: Many reviewers discuss how large and clear the numbers are when they are projected. The best models’ projections are clear enough that they can be easily read even when the user is only half-awake. Projector distance: Ideally, the clock’s numbers should be clearly visible regardless whether they are projected onto the wall a few feet away or the ceiling overhead. Great clocks have projectors with wide ranges. 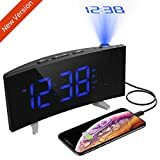 Light emissions: The projection is only part of the light that the clock will give off; the base itself also gives off light, which can be a distraction. Better models are solidly constructed and give off very little “light noise”, allowing users to get a good night’s sleep. Radio quality: For models that come with a built-in radio, it’s important that it come with a strong antenna and good speakers to give the user excellent sound quality in the morning. 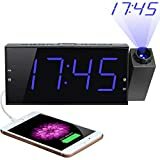 Number size: When you look at the clock’s specifications online, note the projection size for the numbers; even though there will be some differences depending on how far away the wall or ceiling you plan to project on will be, be sure to go with a model with a nice, big display. 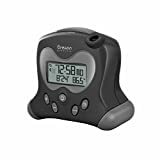 Controls: Look for a clock that comes with dimming controls (for both the base and the projection), as well as one that features a projector that swivels, which will make it easier for you to control where the numbers are projected on the wall or ceiling. 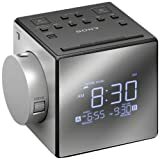 Battery backup: This is an important feature for any plug-in alarm clock. Look for a model that will run on battery power for hours in case of a power outage. Electrohome: Electrohome is a Canadian company that specializes in producing electronic home appliances. Founded in 1907 as a phonograph company, today, Electrohome produces a wide range of home accessories. La Crosse Technology: La Crosse is an American company that manufacturers an array of electronic devices for home and office use, including a number of extremely accurate atomic clocks. Supersonic: Supersonic is an American producer of electronic devices and accessories. 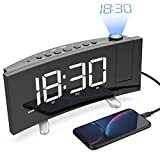 The company offers a wide range of products, including clocks, stereos and speakers, and aftermarket peripherals for cell phones and computers.